Who says Christmas trees need to cost a fortune? 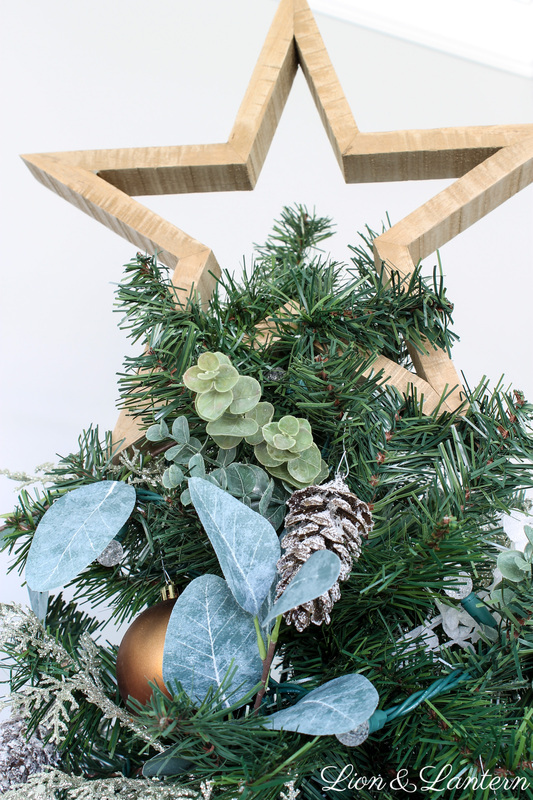 Dress up a simple tree with faux eucalyptus stems, glitter branches, frosted pinecones, and metallic ornaments for a pretty and rustic look. 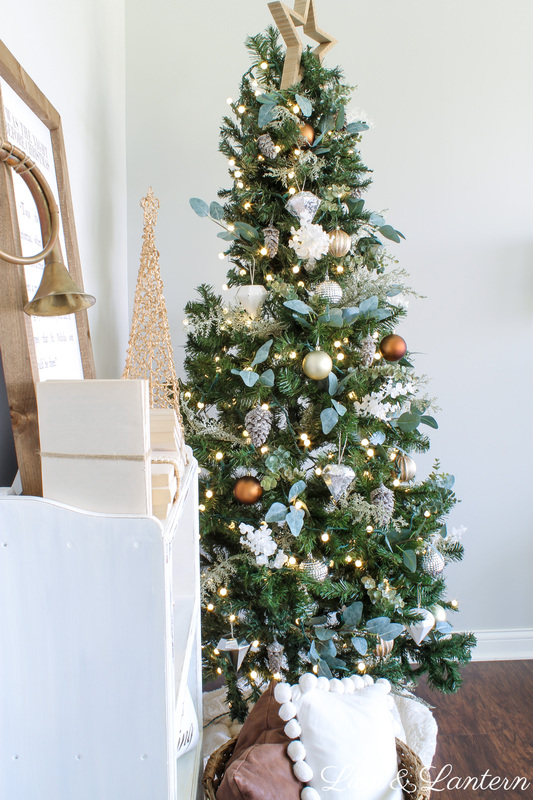 A wooden star topper and cozy blanket used as a tree skirt add a farmhouse touch to this rustic Christmas tree. Happy Sunday sweet friends! I hope that you all had a restful and yummy Thanksgiving. We hosted for the first time and it was a special day with family that I know I will always remember. And now that turkey day has come and gone… it’s officially time to spread Christmas cheer! 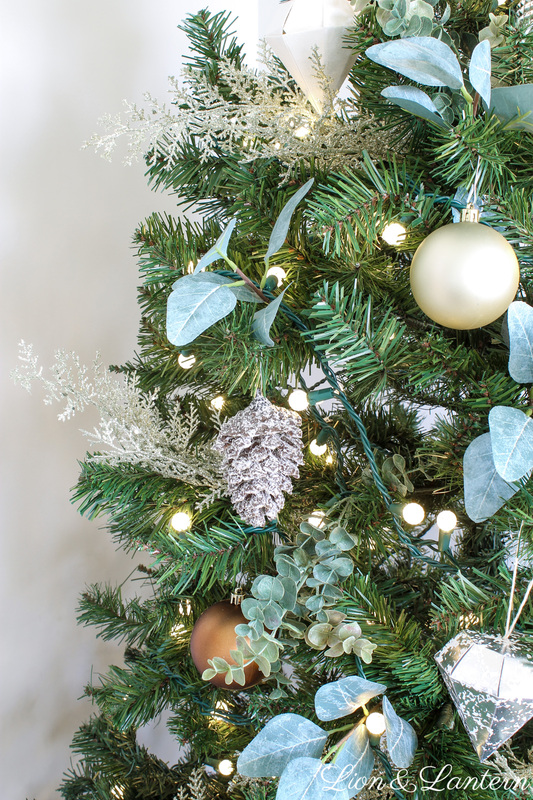 I’m so excited to be taking part in a Christmas decor BLOG HOP today with the sweet ladies from some inspiring decor blogs. You don’t want to miss this! I’ll be linking to a bunch of festive posts below, so stay tuned! And if you are visiting Lion & Lantern for the first time as a part of the hop, welcome friend! 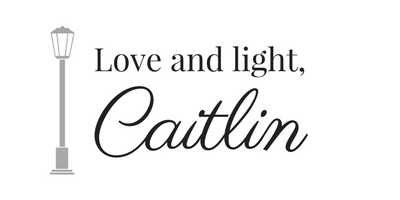 I’m Caitlin—wife, mama to a toddler boy, and lover of good books, simple decor, and staying home 🙂 Click here to learn more about the blog, and be sure to sign up for my email list at the side or bottom of this page to stay up to date! 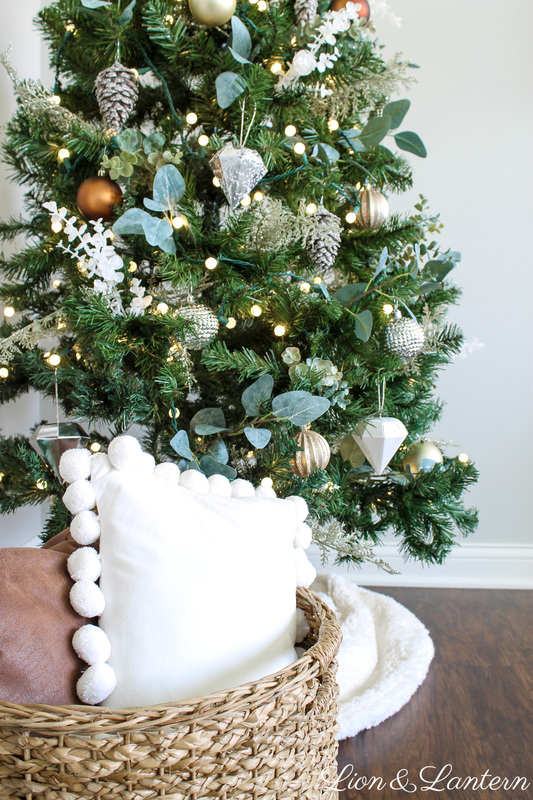 For my part of the hop, I’m sharing our simple and budget-friendly rustic Christmas tree. Let’s get started! Decorating for Christmas this year has been particularly special for us since this is our first holiday season in our house! We moved in last January, and I’ve had Christmastime in the back of my mind every since. 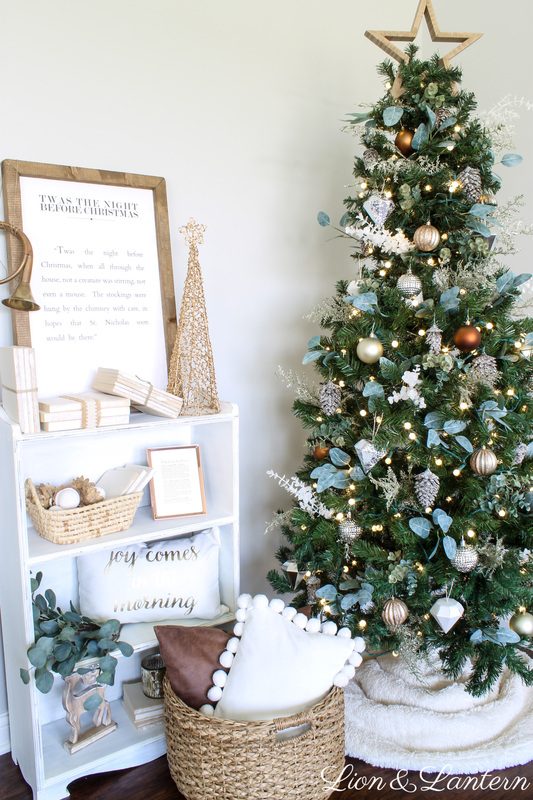 I just love the warmth and coziness of the season, and I wanted to bring that feel into our home. I shared our our bookshelf decked out for Christmas recently, and it was fun to rearrange things a bit to fit the tree in this corner too. We moved our comfy armchair into the middle of the living room to free up some space, and now I love the festive feel of this little nook! 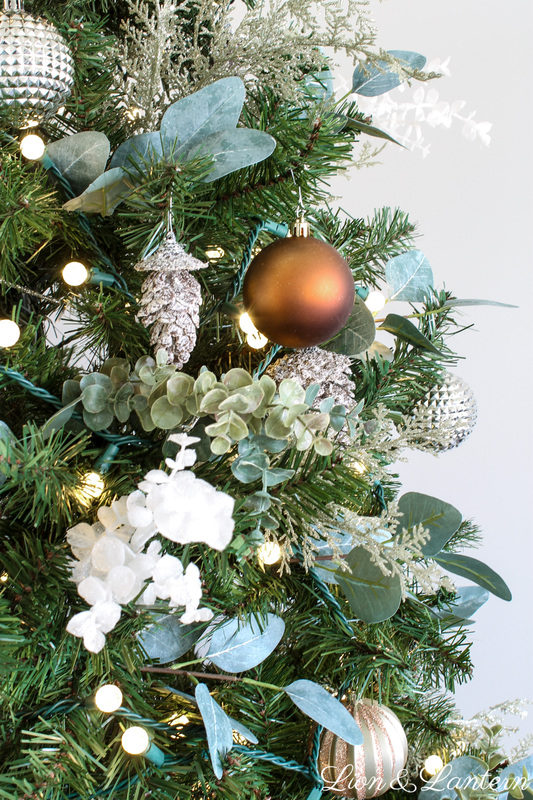 For our Christmas tree this year, I decided to create a natural, rustic look with metallic accents. 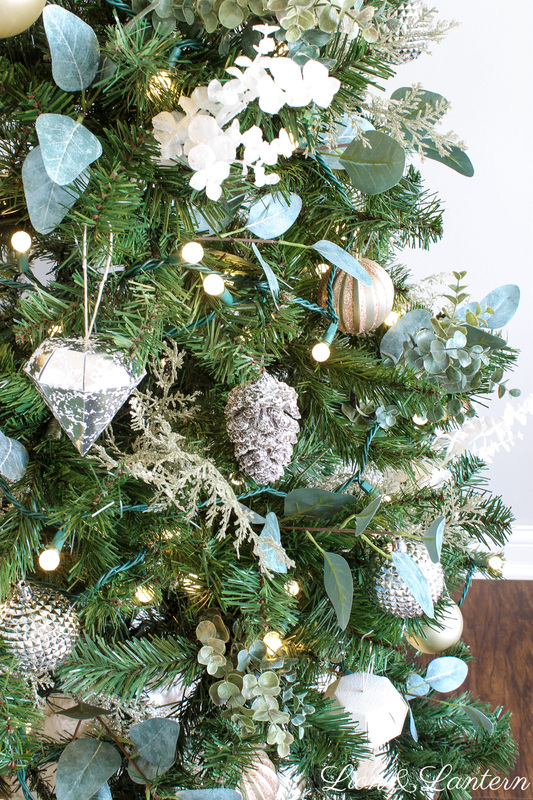 I love the gorgeous flocked trees that many people are using this year, but a new tree just wasn’t in our budget. 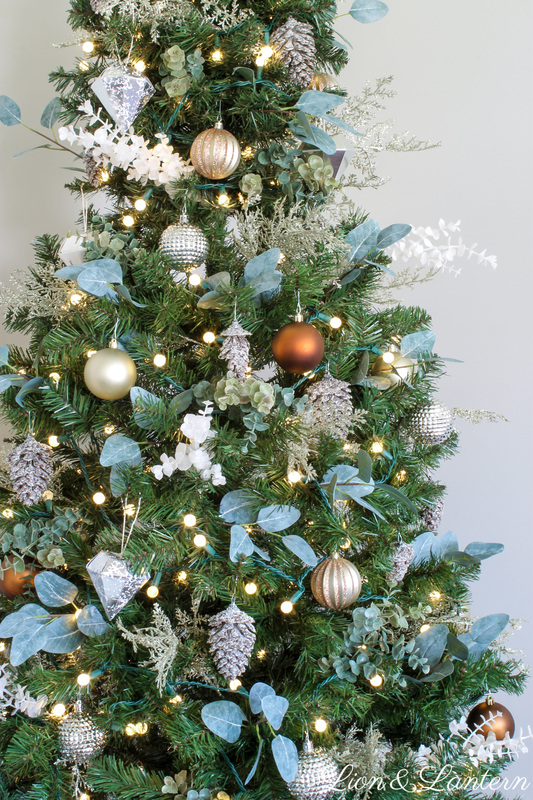 Instead, I decided to dress up our tree with faux floral stems to fill sparse areas and to add a natural touch. I found all of the eucalyptus at Michael’s one day for 60% off! I purchased several “bushes” of each type and used wire cutters to snip smaller sections. 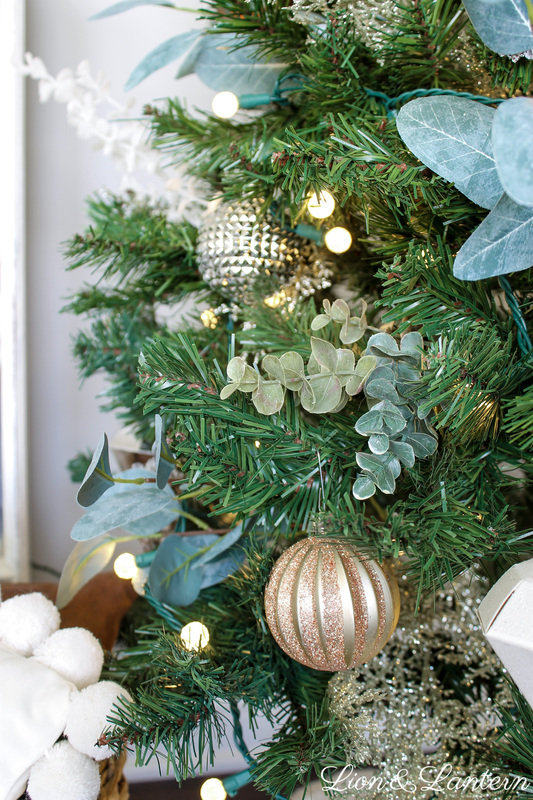 The gold glitter branches are from Hobby Lobby and add a touch of glamour. 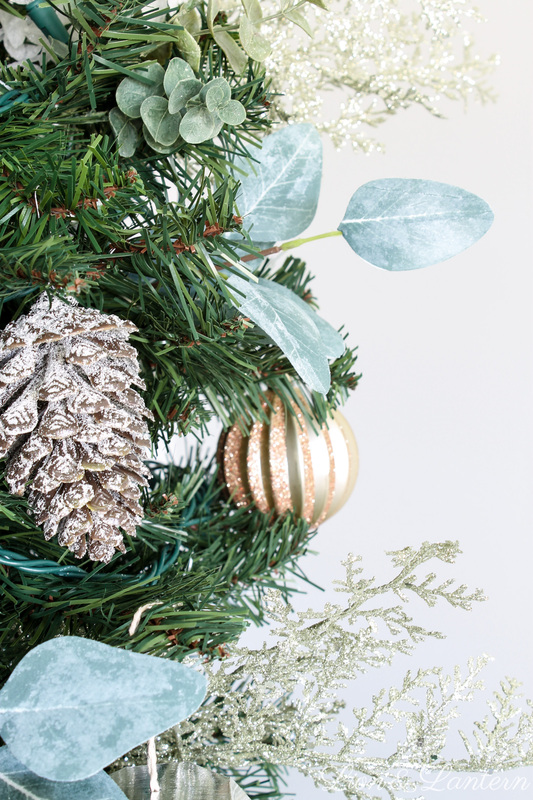 For ornaments, I used copper, gold, and silver baubles from Target (last year) and glittery faux pinecones from Hobby Lobby. 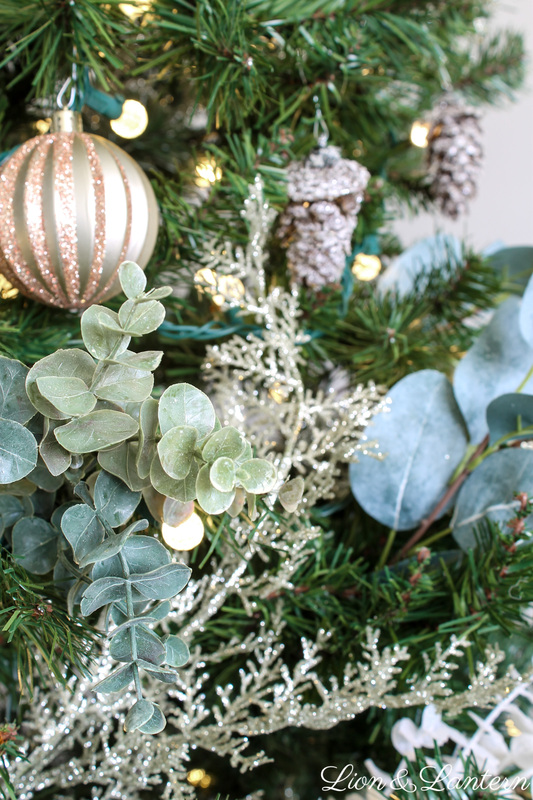 While the greenery echoes the natural beauty of winter, the metallic ornaments add that hint of whimsy and magic that we all love at Christmastime. To dress up the bottom of our rustic Christmas tree, I wrapped a fluffy white blanket we already had around the base as a tree skirt. I saw a few skirts I liked while out shopping but knew I could achieve a similar look without spending a dime! And for the final touch, I added a wooden star from Michael’s to the top of our tree as a reminder of our Savior’s birth, the true joy of the season. I love telling Bug about the star and how it points to the hope we have in Jesus! 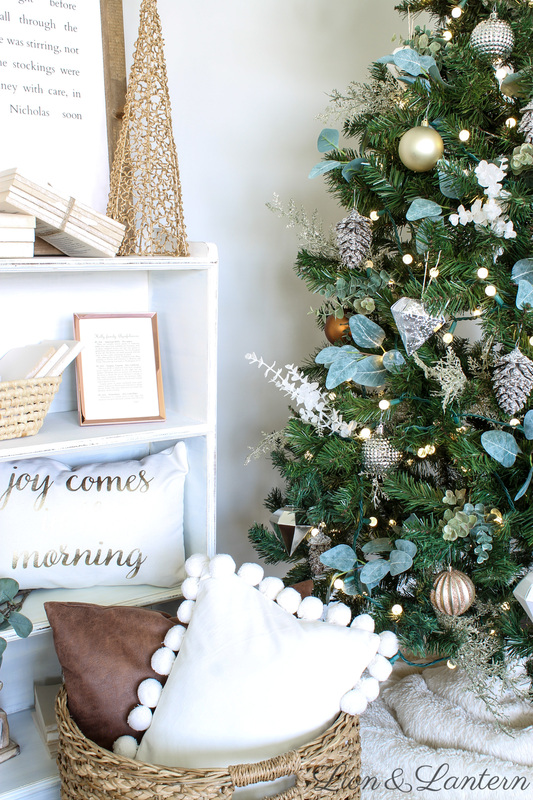 I also hope you will continue along on our Jingle Through Decor Blog Hop and enjoy all of the festive inspiration from these lovely bloggers! Next up on the hop is Emily from Casa California, and you don’t want to miss her beautiful space decked out for the season. 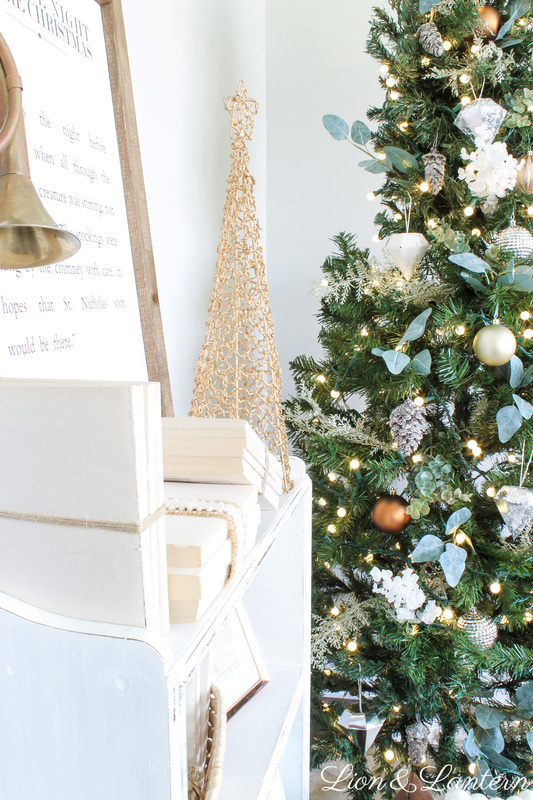 Here’s a quick list of the other blogs on our Jingle Through Decor Blog Hop! Caitlin!! your tree is gorgeous! I love it so much with all the different greenery sprigs in it. You did an amazing job! Also — 60% off is the way to go! What a deal! I did a small tree in our master bedroom this year and did the same thing for a skirt. I didn’t have the budget for one so I actually used a scarf! Worked just as well and looks super cute. I love the fluffy blanket. Caitlin, your home looks absolutely stunning. I love that Pom Pom pillow. Your tree looks amazing! I’m so glad to have met you through this hop! Have a wonderful first Christmas in your home! Caitlin, your Christmas decor is so beautiful! 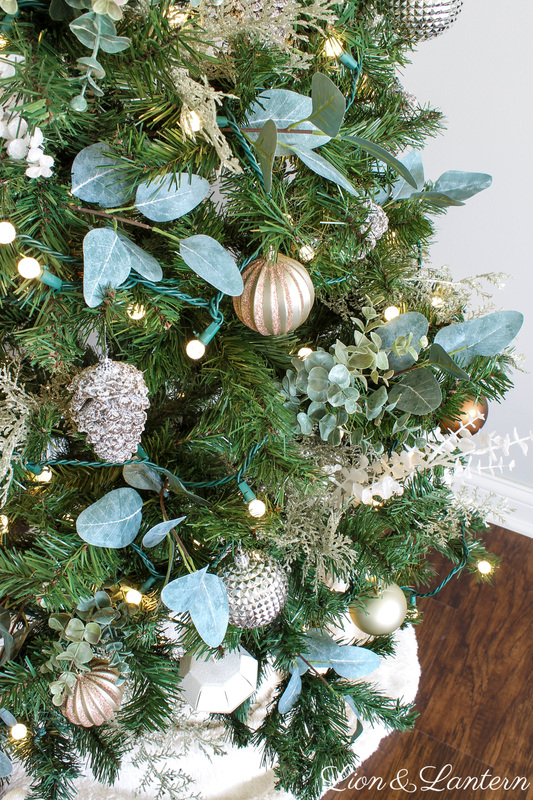 I love all the sprigs or greenery throughout your tree!! Natural, simple and really stunning!! Thank you so much for joining us! I’ve really loved doing this with you!! Love the star tree topper! Where did you find that?